RYAN ROBINSON LOVES YOUR FACE: Snowbirds, a favorite of Apartment Therapy! 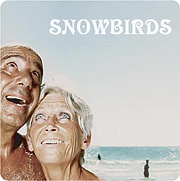 Snowbirds, a favorite of Apartment Therapy! One of the many daily blogs that I'm addicted to, Apartment Therapy has a feature up right now about large scale artwork as a focal point in your home. One of their favorites is none other than your's truly! Check out the post here, or just take a gander at the photo below!!! Thanks Apartment Therapy!! And you can always view the Snowbirds on the link to the right! Shooting a sweet campaign this week . . .
Who has two thumbs and loves shooting on Mondays? How NOT to start a weekend . . .
How to end a great weekend. New wheels for the studio!